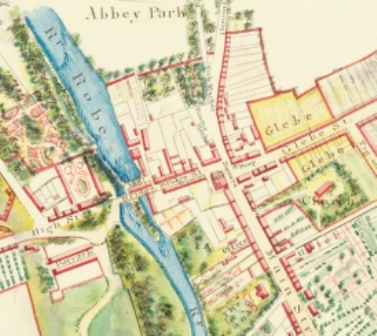 Gore Ouseley Kelly's established his printing and publishing house in Ballinrobe immediately after the Great Famine. He was a native of Loughrea, and his wife, Eliza Connor whom he married in Dublin in August 1849, was from Roscommon. After their marriage, they settled in Ballinrobe where he appointed an agent for The Nation newspaper. A Roman Catholic, he was among the first subscribers to the building of a new church in Ballinrobe. In the years before his marriage he had worked at the Tuam Herald which was established by his older brother Richard in December 1837. The earliest surviving book printed in Ballinrobe is the Special Report on the Trial of the Rev. David Mylott R.C.C. against the Rev. John O'Callaghan and others at Castlekirk Church, tried at the Tuam Court of Petty Sessions on the 16th and 30th January 1850 written by P.W. Tansey of the Tuam Herald from his short-hand notes and printed at Gore Kelly's Printing Office on Market street, Ballinrobe which he rented from Mary Kelly. Their daughter Mary was born in November 1851. A son Henry who in later life became a butcher in Tuam came next. Another daughter, Frances Susan, known as Fanny, born in November 1853 competed the family. Neither daughter married. In September 1866 the first edition of the Ballinrobe Chronicle and Mayo Advertiser appeared. Fifteen months later, on the morning of Sunday 22nd December 1867 a fire destroyed Kelly's dwelling house and printing works which caused the production of the Chronicle to be suspended. A public meeting of the inhabitants of Ballinrobe was held in the Valkenburg Hotel the following weekend and it was agreed to open a subscription list "to alleviate at least the pain and anguish under they trying circumstances of the case" and help him re-establish his business. Robert Tighe acted as chairman of the ad-hoc committee, Thomas Tighe as secretary and R. Jones of the Bank of Ireland was treasurer. A sum of over £230 was pledged at the meeting. By 11th April 1868, the printing works were back in operation and Claremorris Union accepted his tender for printing and his newspaper as an advertising medium. In the same year he also printed 400 copies of the Quere Book. In addition to the weekly Chronicle and a steady stream job printing, he printed Rev. Dr. McEvilly's Commentaries on the Holy Gospels and Epistles which the future archbishop penned while he was president of St. Jarlath's College. In 1870, as the national movement for tenant rights was getting underway, Gore Kelly was secretary to a mass meeting in Ballinrobe which called for 'fixity of tenure.' Ten years later the Chronicle was among the first to publish the word 'boycott' and in 1882 it broke the news of the Maamtrasna massacre. On the 9th January 1874 Eliza died unexpectedly at the age of 54. Gore Kelly died on 1st February 1891 aged 74 years and his daughter Mary took over as proprietor, editor and manager, which was almost unheard of in Irish business at the time. She also acted as secretary to the Irish Industries section of Hollymount Show in 1894, 1895 and 1896. When the Show was discontinued she acted as secretary to the annual Mayo Industries Exhibition for the promotion of Cottage Industries held in Castlebar House Demesne in the opening years of the 20th century. She was elected to the Irish Branch of the Institute of Journalists in 1895. In June 1902 she presented copies for the Chronicle from 1880 to 1901 to the Dept of Agriculture and Technical Instruction. Mary and her sister Fanny left Ballinrobe after the closure of the newspaper on 1st October 1903. They went to reside at 3, Upper Sherrard Street, in Dublin where Mary died on 20th March 1922. She was buried in Glasnevin. When she left Ballinrobe, she handed over the printing works to its manager John Feerick in recognition of his faithful service. The printing office was still running in 1927.